1. Introduction; 2. High-frequency and high-data-rate communication systems; 3. High-frequency linear noisy network analysis; 4. High-frequency devices; 5. Circuit analysis techniques for high-frequency integrated circuits; 6. Tuned power amplifier design; 7. Low-noise tuned amplifier design; 8. Broadband low-noise and transimpedance amplifiers; 9. Mixers, switches, modulators, and other control circuits; 10. Design of voltage-controlled oscillators; 11. High-speed digital logic; 12. High-speed digital output drivers with waveshape control; 13. SoC examples; Appendix 1. Trigonometric identities; Appendix 2. Baseband binary data formats and analysis; Appendix 3. Linear matrix transformations; Appendix 4. Fourier series; Appendix 5. Exact noise analysis for a cascode amplifier with inductive degeneration; Appendix 6. Noise analysis of the common-emitter amplifier with transformer feedback; Appendix 7. Common-source amplifier with shunt-series transformer feedback; Appendix 8. HiCUM level 0 model for a SiGe HBT; Appendix 9. Technology parameters; Appendix 10. Analytical study of oscillator phase noise; Appendix 11. Physical constants; Appendix 12. Letter frequency bands; Index. 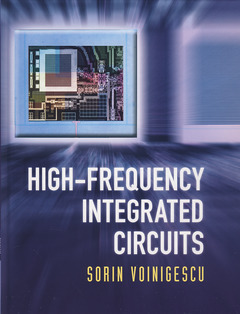 Sorin Voinigescu is a Professor at the University of Toronto, where his research and teaching interests focus on nano-scale semiconductor devices and their application in integrated circuits at frequencies beyond 300 GHz. The co-founder of Quake Technologies, Inc., he was a recipient of the Best Paper Award at the 2001 IEEE Custom Integrated Circuits Conference, 2005 IEEE Compound Semiconductor IC Symposium (CSICS) and of the Beatrice Winner Award at the 2008 IEEE International Solid State Circuits Conference (ISSCC). His students have won Student Paper Awards at the 2004 VLSI Circuits Symposium, the 2006 RFIC Symposium and at the 2008 International Microwave Symposium.